The new Amazon Kinesis management console (see screenshot below) makes it easy for you to learn about real-time analytics and simplifies the console user experience. You can use the new visual learning tools in the console to understand how Kinesis Streams, Kinesis Firehose, and Kinesis Analytics can help you stream real-time data from various data sources to AWS, and then process, analyze, and load the data to data stores. The new console experience also includes a dashboard showing all your Kinesis resources on one screen when you log in. 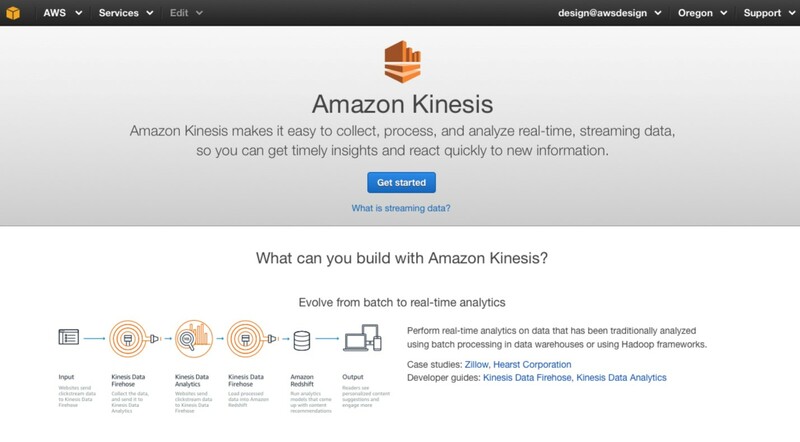 To get started, visit the Amazon Kinesis management console. For information on where Kinesis Streams, Kinesis Firehose, and Kinesis Analytics are available, see the AWS region table.